How do I run an Item Analysis on my Canvas Assessment? Navigate to your Canvas course. On the course navigation menu, click Quizzes. On the Quizzes page, locate the desired assessment item. Click on the the assessment title (e.g., click the "Quiz 1" title). On the quiz page that appears for this assessment item, click Quiz Statistics in the upper right corner. 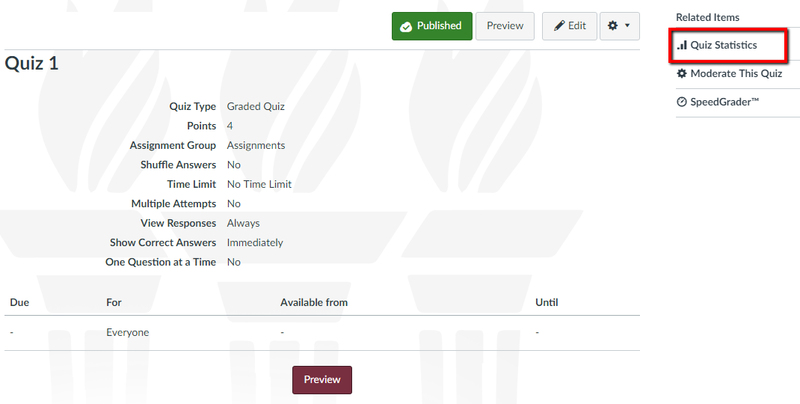 The Quiz Summary page will appear and you will see the average score, high score, low score, standard deviation, and average time that students spent taking the assessment. If you are teaching a cross-listed course (site containing more than one course section), you can filter your view of these statistics to get section-specific information. To get the item analysis, click the Item Analysis button in the upper right corner. How can I randomize questions in a question group (test pool) for my quiz? How do I add an existing question bank to my quiz? How do I export/import quizzes in Canvas? 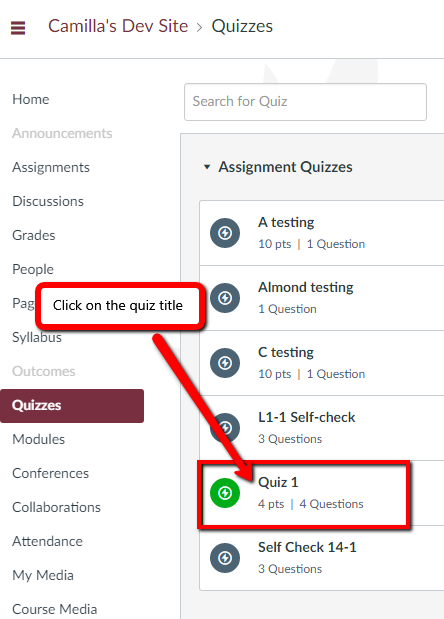 How do I make a test/quiz in Canvas? How do I make Question Banks? I don't want my students to be able to see a quiz that I'm working on. How do I hide it from them? What question types are available in Canvas? What test/quiz settings are available in Canvas?